Careerz360 signed a MoU with the University of Lahore on 7th of November, 2017. 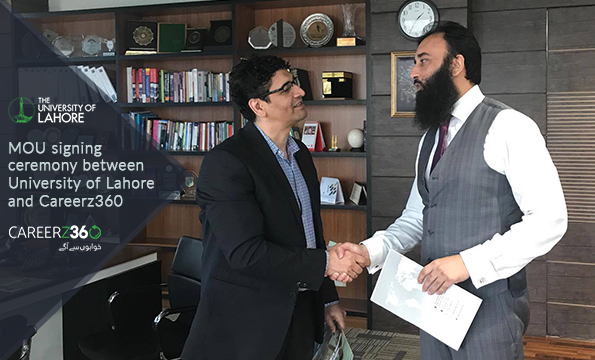 The memorandum signing was held at UoL campus where chairman University of Lahore Mr. Awais Rauf and CEO of Careerz360, Mr. Farooq Ahmed led the ceremony. Moreover, Mr. Umer Bakhtiyar, Head of IT at Careerz360 and Mr. Muhammad Tipu, Head of Sales, Careerz360 were among the attendees of the meeting. The memorandum signing was perceived as a splendid step towards bridging the gap between academia and industry. It specified that Careerz360 will be assisting UoL and its associated businesses in their recruitment endeavors. Additionally, Careerz360 will also be providing placements to their students and alumni. In this manner, UoL graduates will go through a smooth transition from academia to the job industry. Careerz360 also pledged to supply IT solutions to UoL regarding their recruitment efforts. Careerz360 also agreed to welcome the projects of UoL students on their platform and facilitate them in finding investments.